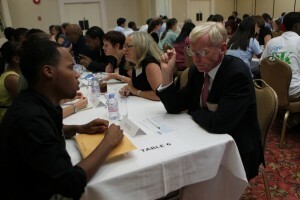 Business Bermuda will host the 13th Annual College Student Networking Event (CSNE) on 21st July 2011 at the Fairmont Hamilton Princess. For the past 12 years, Business Bermuda has worked to ensure that Bermuda’s business professionals have the opportunity to meet those upcoming university and college graduates who are available for employment and advancement in our workplace. At the same time, Bermuda’s business professionals also offer insight to the students into the skills needed, beyond the classroom, for these young individuals to transition successfully into the business arena. This event gives college students the unique opportunity to practice and hone their networking skills. Last year, over 250 students and 225 professionals participated in the event, numbers that are set to be repeated this year. Every year, the event attracts a wide variety of Bermuda’s college and senior high school students. Many return year after year to make connections in the business community while sharpening their networking, interviewing, and résumé-writing skills. Whilst the event is not a career fair, several students have been lucky enough to find employment after making a great impression networking at the event. The event will consist of two informative career seminars, a speed networking session, and a large exhibition area. “In response to feedback from professionals and students who attended last year’s event, we have changed the format slightly this year by taking out the keynote speaker in order to allow professionals and students more time to network in the exhibitor area and to maximize the quality of the two career seminars. When we started the event 13 years ago, it was much smaller and a keynote speaker was an important part of the event, but it has grown in size and scope and networking is now the most important element of the event. There will again only be one speed networking session, giving 90 students (and 90 professionals) more of what they love most about the CSNE,” added Ms. Packwood. Professional organisations can exhibit for free, and there is a nominal fee for companies taking exhibition space in the Harbourview Ballroom of $100 to Business Bermuda members and $500 to non-members. Alternatively, non-members can apply for a year long Associate Membership with Business Bermuda and exhibit for only $575. Business Bermuda is inviting all students, business professionals, and educators to take part in the event. Companies can also participate as an event sponsor by offering prizes. In previous years, students have won seasonal internships, laptops, travel vouchers, iPods, and even an iPad. For the 2011 event, North Rock Communications is already confirmed as a sponsor, offering an iPad and an internship. Conyers Dill & Pearman is sponsoring the event with a $500 travel voucher for another lucky winner. Aardvark Communications is also sponsoring the event by offering an iPod. There are 15 sponsor spaces available. All companies are also invited to include gifts in the student goody bags, which are provided by PureNERGY Renewables.